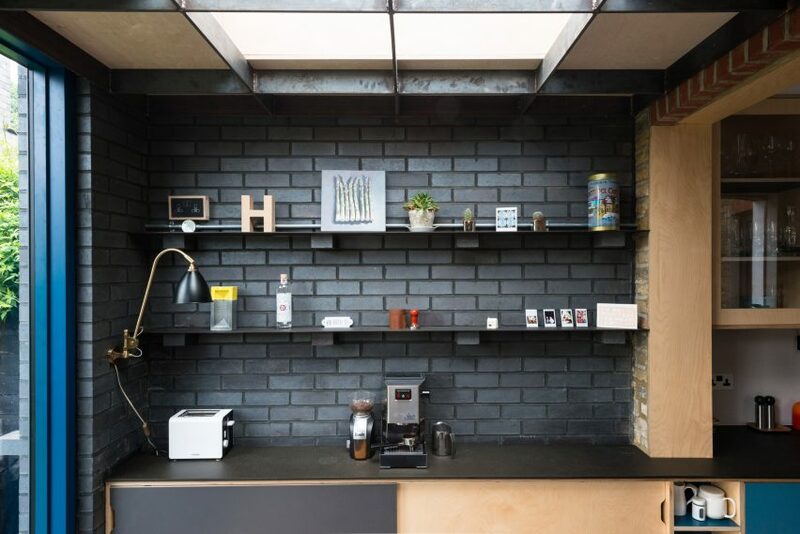 The founder of MW Architects used black-blue engineering bricks to add an extension of just seven square metres to his renovated London home. Previously, the central hall of Matt Wood’s narrow Victorian house has been used as a dining room. However, as the main circulation point that links the front and back of the building as well as the main staircase, it felt cramped and claustrophobic. 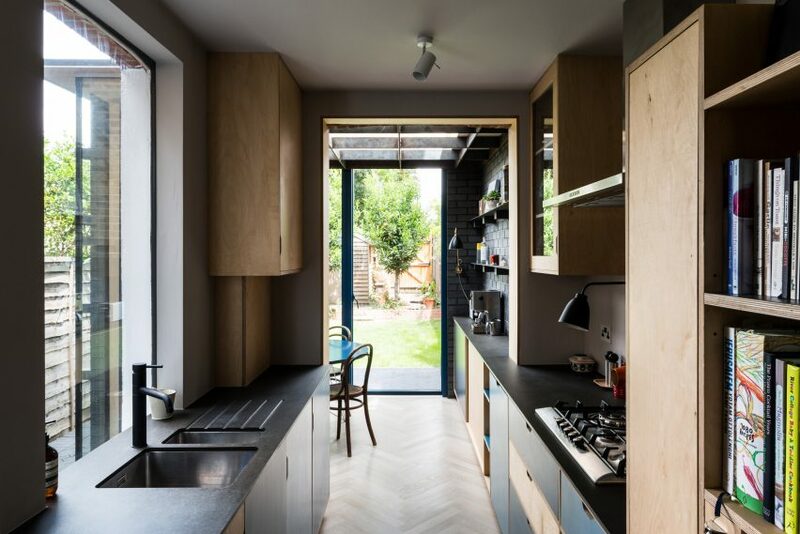 The idea of extending into the side return was constrained by the position of the house, which tightly abuts the neighbour’s property and already receives limited light, as the back of the house faces north. 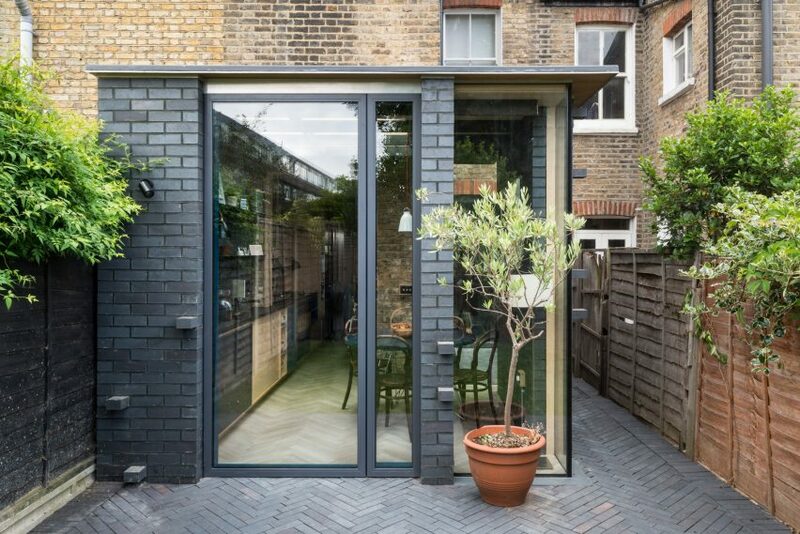 Instead, the kitchen-dining extension was relocated to the very back of the house, leading off the galley kitchen and creating a clear sightline from the hall through to the garden. 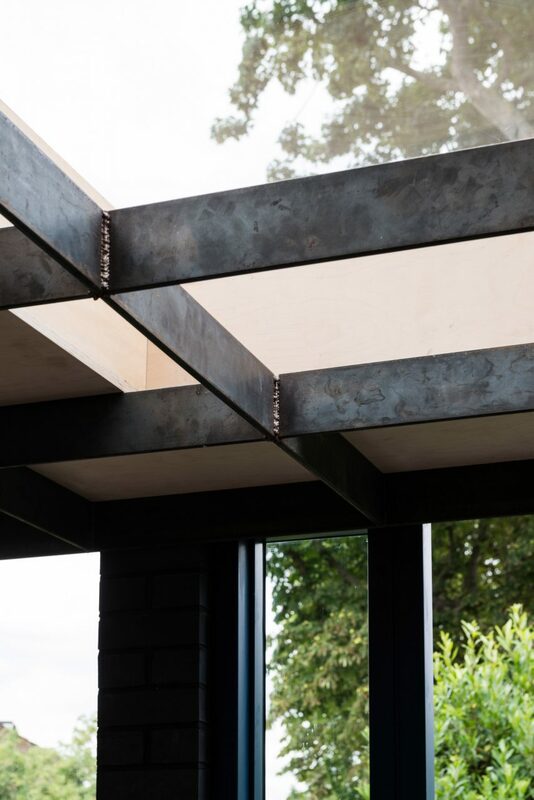 The design maximises the feeling of space, with a frameless, glass-cornered window, and a thin, “visually light” steel-latticed roof. The smooth-fronted plywood and laminate kitchen units were custom made to fit and maximise the narrow space. “The size of the extension meant we had to be really precise and rigorous,” Wood told Dezeen. 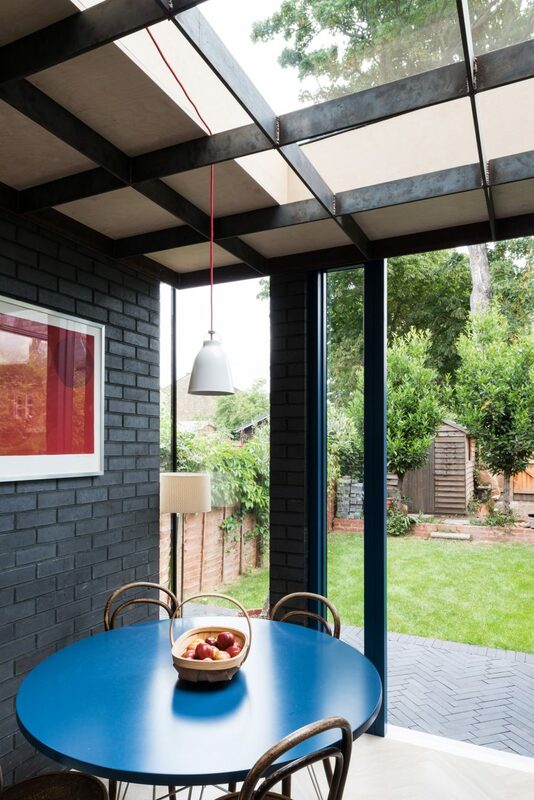 To contrast with the yellow brick of the original house, the extension is made from dark Staffordshire blue engineering bricks, which are more commonly used for damp proofing below ground. 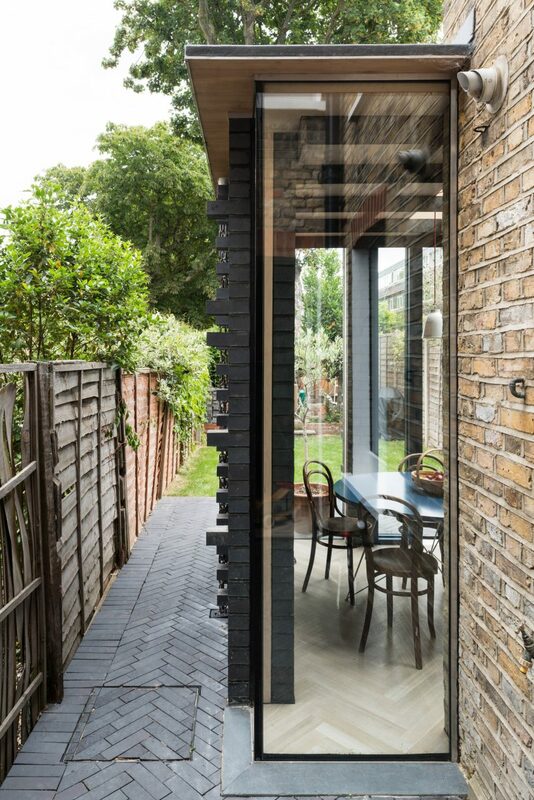 The exterior walls of the extension are enlivened by the occasional brick positioned at right angles to jut out from the wall. The motif serves a function on the side elevation, where a thick copper rain chain has been used in place of a water pipe. 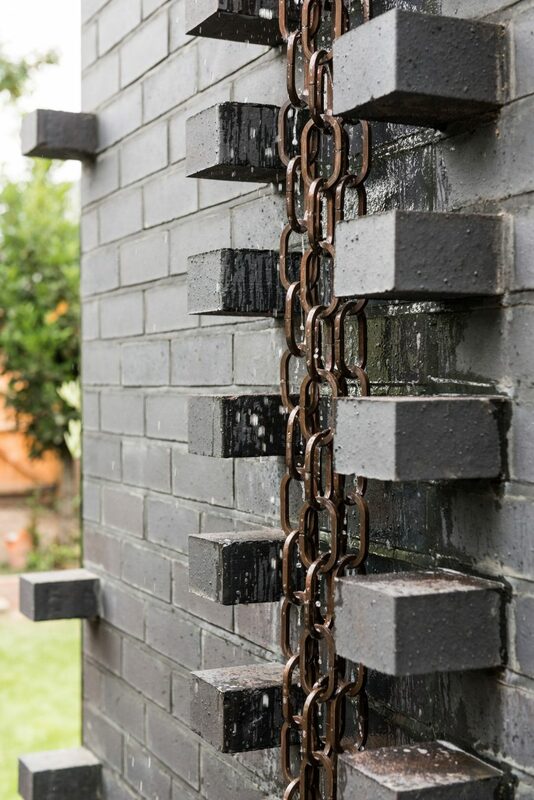 “You see copper rain chains in Japan quite often,” explained Wood. The mix of light and dark materials, as well as the use of colour, have been carefully balanced throughout the house to offset the discrepancies in available light. The south-facing front room has been painted a deep blue, as has the stairway, and there are accents of blue throughout the ground floor, while the inner hall and galley kitchen have been painted white to reflect the natural light. By having a dark wall at the end of the space, it makes it harder to perceive the depth, creating a greater feeling of space. The indoor floor is covered in a pale herringbone parquet, and the pattern is continued outside on the patio in dark herringbone brickwork.